Understanding Egyptian Collections, part 2. 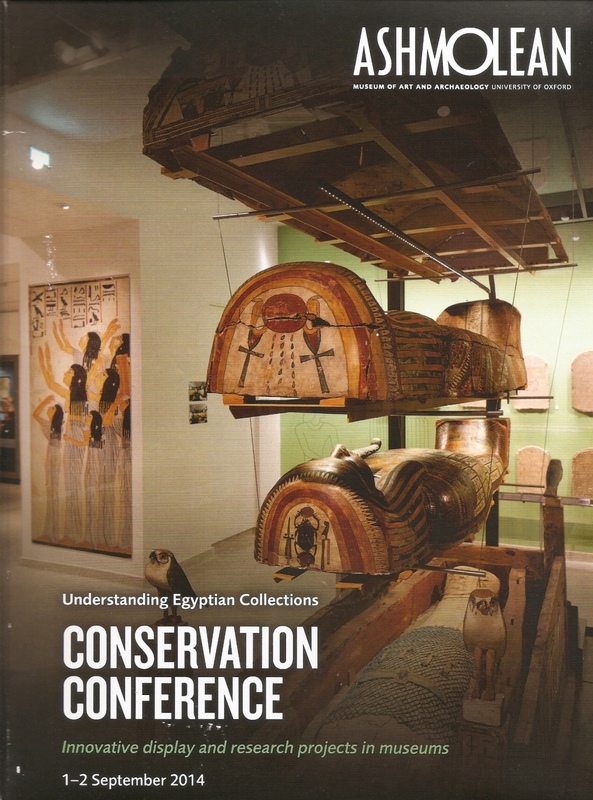 Following on from part one, this blog post discusses the recent Understanding Egyptian Collections conference at the Ashmolean Museum. As before it aims to highlight some of the key themes from the conference: Display, Public Engagement and Outreach. Susi Pancaldo, Senior Conservator at UCL Museums and Collections, presented a paper on the problems and possibilities for the Petrie Museum of Egyptian Archaeology’s pottery display. The Museum’s pottery display, housing approximately 3,400 objects arranged over 36 cases, was suffering from a lack of mounts, limited interpretation, and overcrowded displays making access difficult. There were also on-going environmental problems, with over-exposure to light and extremes in relative humidity and temperature. In January 2014 the Museum started a project to enhance the display, with the aim to improve environmental conditions and visitor experience. New funding opportunities have allowed the Museum to install new LED lights and in-case fittings, renew efforts to control relative humidity, and fund various conservation and mounting projects. In terms of enhancing gallery design and interpretation, the Petrie Museum is working on a new introductory interpretation panel and showcase, which will serve as a model for the on-going redevelopment. It also aims to tell human stories using the pottery and highlight key objects and object groups, through a new design strategy, in order to make individual pieces and stories stand out from the collection. Lisa Bruno, Head Objects Conservator at Brooklyn Museum, gave an interesting talk on the Museum’s ‘Mummy Chamber’. The gallery, which opened to the public in 2010, was the first time the Museum had displayed their collection of mummified human remains. Having been collected for their wrappings and un-wrapped in the Museum’s early history, the human remains had not been considered art and so were never displayed, nor were they formally acquired. Inspired by the touring exhibition ‘To Live Forever’, Brooklyn Museum developed a permanent gallery to discuss mummification and funerary practices. The Conservation department was heavily involved from the beginning with CT scanning the human remains and re-wrapping them in their original wrappings, where possible. Interestingly, the Museum chose not to display one Egyptian mummy that could not be re-wrapped, making the distinction that to do so would be to display a corpse and not a mummy. The feedback collected by the Museum showed that visitors were mostly in favour of their display, but the speaker questioned if that would be the case had they chosen to display un-wrapped human remains. As such, the talk provided a fascinating discussion into the changing values and ethical approaches towards the care and display of human remains. Molly Gleeson, Rockwell Project Conservator at Penn Museum, spoke about their on-going project, the Artifact Lab: a project that brings the conservation of ancient Egyptian objects into the public sphere with a working, purpose built conservation laboratory on gallery. The Artifact Lab currently focuses on the conservation of ancient Egyptian human and animal remains, as well as related funerary objects, and provides a space where the public can see conservation in action, talk to the conservators at work, and find out more about treatments in a linked exhibition area. This talk raised some interesting questions about ethical approaches to working with human remains in the public eye. The ancient Egyptian mummies have always been one of the biggest draws for the Museum and are currently being conserved ready for re-display in the future. Ethical considerations included situating the Artifact Lab away from the main thoroughfare, so visitors can seek out the gallery having been informed of its content, rather than stumble upon it. Whilst in the lab, human remains are also kept covered and are only uncovered when a conservator is working on them. There are also similar ethical considerations in choosing images and stories for any of the project’s social media. With regular social media updates through Twitter and their blog, the Artifact Lab sets a high standard for public engagement and outreach and has long been a favourite of mine. It’s always fascinating to hear about projects that encourage museum audiences to engage with Egyptian objects and subjects in a new, inter-disciplinary light. I was, therefore, even more delighted to hear that this approach has resulted in a more collaborative conservation process, with members of the public and specialists sharing their knowledge of particular objects. With the success of this project being demonstrated by a three year extension at the Penn Museum, it would be great to see similar projects being explored in the UK. Stephen Devine and Sam Sportun, from Manchester Museum, introduced conference delegates to some of the digital engagement and interpretation initiatives that form part of the Ancient Worlds gallery experience. Stephen Devine, Digital Communications Officer, began by introducing the mobile app designed to be used within the gallery alongside the objects but also to bring the gallery experience to audiences outside the Museum. Access codes on object labels allows the visitor to unlock content, which can feature anything from interviews and blog posts, to 360 degree images of objects. The mobile app provides a flexible means of interpreting material, allowing the gallery to remain free from excess information that might detract from the visitor’s physical gallery experience. Sam Sportun, Collections Care Manager/Senior Conservator, spoke about the Museum’s current research into the use of digital technology to augment the handling experience in museums, in particular the use of Haptics and digital touch. It was fascinating to hear how the Museum plans to use these new technologies to improve inclusiveness through physical interaction with the collection, creating a digital experience that can be used as part of the gallery space but also in outreach for those that cannot access the Museum, for example in hospitals for well-being sessions. This approach also aims to improve access to objects that are too fragile or vulnerable to investigate as part of a traditional handling collection. Museum of Fine Arts, Boston – King Menkaura in motion. Fitzwilliam Museum – Mummy case saved by LEGO. ← Statement on the Loss of Antiquities from Public Collections.